Holly Clegg, author of the trim&TERRIFIC cookbook series, introduces her fun, whimsical women’s lifestyle cookbook perfect for a gift or the kitchen. This 240-page book includes more than 200 easy, everyday recipes with almost 100 photographs and illustrations. Too Hot in the Kitchen is a practical, user-friendly cookbook designed for busy women and includes: 200 easy-to-prepare recipes, Nutritional information and diabetic exchanges, Symbols to highlight Freezer Friendly and Vegetarian recipes, and Creative coffee pairing ideas. Includes fun and entertaining chapters on: Cooking for two (Table for Two); No bake dishes (Lovin’ No Oven); Recipes for facial treatments (Diva Dermatology); Party recipes for groups (Effortless Entertaining). 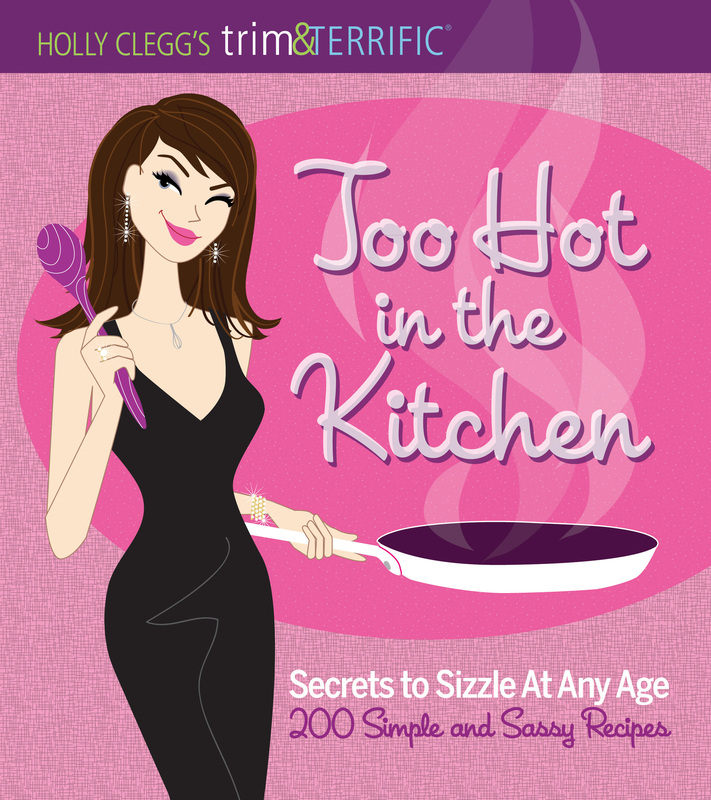 Finally, a book to guide women through the kitchen with a smile, so get ready to learn the secrets to sizzle! 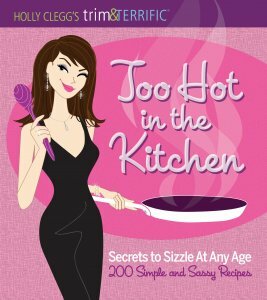 I found Too Hot in the Kitchen to be a fun read with lots of interesting recipes and helpful tips for women of any age. There are chapters as diverse as Coffee & Food Pairings, Lovin’ No Oven, and Food for the Mood, as well as recipe for body scrubs and face masks. In addition, sprinkled throughout each chapter is “spicy advice” which gives suggestions on how to modify a recipe if you don’t have all the ingredients, or need to make ahead, etc. My only complaint is that the book seems to be a bit of a hodge podge. I would have liked to see all the recipes be closer to the perceived theme, which was for me was food for the different stages of a woman’s life. I give Too Hot in the Kitchen four stars. It’s entertaining and educational with easy to make recipes. Check it out!! I was given a complimentary copy of this book for the purpose of review. All opinions are 100% my own. With over 1 million cookbooks sold, Holly Clegg has become a healthy culinary expert on practical easy, healthy recipes through her best-selling trim&TERRIFIC® cookbook series, including the more health focused cookbooks, Diabetic Cooking with the ADA, Eating Well Through Cancer and Eating Well to Fight Arthritis. I haven’t read a cookbook with that theme before. I like that the book has chapters for no bake recipes and meals for two people. It sounds like an interesting book. I like the idea of recipes for facials, too, lol! This sounds like something I would get into, only because I love the cooking idea around holidays , doesn’t matter what holiday.. I love the whole concept. Besides food there are facial recipes. Great ! I love how your dumplings came out. Thanks for your review. Would love to know how to cook! This would be great for us! This sounds like a book my mom would really enjoy! The dumplings sound very tasty. Sounds cute! I like that she included some bath & body recipes as well. Thanks for sharing! Oh yum! I love any type of dumplings. The book sounds interesting, too. Wow, there certainly seem to be a lot of recipe themes in this book- I think I’d probably be most interested in no bake. 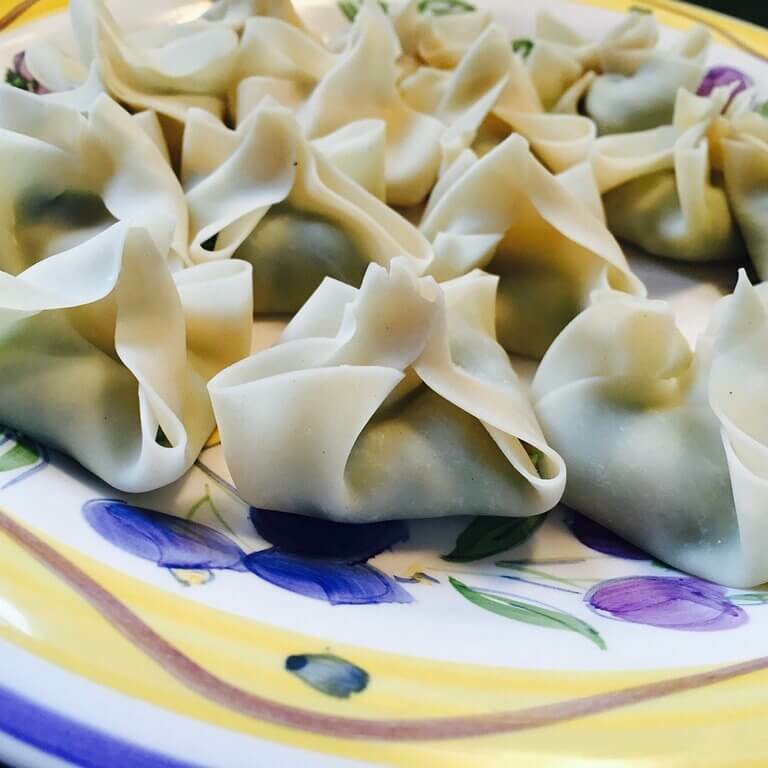 Those dumplings sound perfect for a date night in! I love the concept of this book. I totally believe that food is the way to someone’s heart. Those dumplings look DEElish! Seems like a great and FUN cookbook! My husband loves shrimp AND dumplings! I need to make some for him. Thanks for the review. Love hearing what others thing of something before I buy for myself. Previous Previous post: Writers of the Future Volume 30 Review plus new Webundle! !